Colony stimulating factor-1 (CSF-1) plays an important role in ovarian cancer biology and as a prognostic factor in ovarian cancer. Elevated levels of CSF-1 promote progression of ovarian cancer, by binding to CSF-1R (the tyrosine kinase receptor encoded by c-fms proto-oncogene). Post-transcriptional regulation of CSF-1 mRNA by its 3’ untranslated region (3’UTR) has been studied previously. Several cis-acting elements in 3’UTR are involved in post-transcriptional regulation of CSF-1 mRNA. These include conserved protein-binding motifs as well as miRNA targets. miRNAs are 21-23nt single strand RNA which bind the complementary sequences in mRNAs, suppressing translation and enhancing mRNA degradation. In this report, we investigate the effect of miRNAs on post-transcriptional regulation of CSF-1 mRNA in human ovarian cancer. Bioinformatics analysis predicts at least 14 miRNAs targeting CSF-1 mRNA 3’UTR. By mutations in putative miRNA targets in CSF-1 mRNA 3’UTR, we identified a common target for both miR-128 and miR-152. We have also found that both miR-128 and miR-152 down-regulate CSF-1 mRNA and protein expression in ovarian cancer cells leading to decreased cell motility and adhesion in vitro, two major aspects of the metastatic potential of cancer cells. The major CSF-1 mRNA 3’UTR contains a common miRNA target which is involved in post-transcriptional regulation of CSF-1. Our results provide the evidence for a mechanism by which miR-128 and miR-152 down-regulate CSF-1, an important regulator of ovarian cancer. The colony stimulating factor-1 (CSF-1) and its receptor CSF-1R (encoded by the c-fms proto-oncogene) comprise a reciprocal system that has been previously linked to several human epithelial cancers including ovarian, breast, and prostate cancers[1–4]. Besides its critical role in macrophage differentiation and proliferation, CSF-1 and c-fms are also key players in bone metabolism and female reproduction. In ovarian cancer, CSF-1 also has an important role as a biomarker and prognostic factor, as high levels of this protein were linked to poor patient outcome[8, 9]. CSF-1 was also associated with cancer virulence by having the capacity to augment the invasive ability of human ovarian cancer cells, and by promoting metastasis. CSF-1 has several alternatively spliced transcripts that encode for different sizes of CSF-1 proteins with different functionality. Its biological function as a cytokine in autocrine and paracrine signaling is achieved mostly by a secreted form that is the product of a 3,939nt transcript excluding poly A+ tail. This transcript contains a long, 2,172nt 3’UTR. In ovarian cancer cells, a major unprocessed CSF-1 of 60.1 kDa polypeptide is produced by the 3,939nt transcript. This monomer is processed further by glycosylation and forms an over 200 kDa homodimeric glycoprotein which is the most abundant form of secreted CSF-1 in ovarian cancer[14, 15]. Among the CSF-1 regulatory events, major importance is attributed to CSF-1 post-transcriptional regulation achieved by mRNA 3’UTR binding factors. Previously, we identified GAPDH protein which binds to ARE and stabilizes CSF-1 mRNA leading to post-transcriptional up-regulation of CSF-1 in ovarian cancer cells. MicroRNAs (miRNAs) are small single-strand RNAs of 21–23 nucleotides in length that regulate several biological functions (i.e., differentiation, hematopoiesis, tumorigenesis, apoptosis, development, and cell proliferation) through modulating the stability and/or translation efficiency of target mRNAs. They are predicted to regulate about 60% of mammalian mRNAs. It has been found that mRNAs with long 3’UTRs are more susceptible to miRNA regulation than those with short 3’UTRs as the latter ones lack in number of binding sites necessary for multiple miRNA binding and regulation. Although previous studies have reported miRNA regulation of CSF-1, most of these describe indirect regulation through additional miRNA targeted proteins in non-ovarian cells. To the best of our knowledge, there are only two previous reports of a miRNA that shows direct CSF-1 regulatory abilities in an ovarian system[21, 22]. We predict that, since the 3,939nt CSF-1 transcript has a vast (2,172nt) 3’UTR, miRNAs may play an important regulatory role in mediating the cellular levels and biological functions of CSF-1 in ovarian cancer. In this report, we study 3’UTR targets for binding miRNAs, and find that both miR-128 and miR-152 down-regulate CSF-1 expression in ovarian cancer. Our goal is to identify miRNAs that down-regulate CSF-1 expression, and eventually open an avenue for possible treatment options for ovarian carcinomas. To assess the most common miRNA target sequences located in the 3’UTR of the 3,939nt CSF-1 mRNA, we used the MirWalk text-mining algorithm applied to the mirBase-15 database. This search engine uses its own algorithm to find putative miRNA binding sites for a gene of interest and also compares its findings with a number of other search tools (i.e., miRanda, miRDB, miRWalk, PicTar, PITA, RNA22 and TargetScan/TargetScanS (version 5.1)[18, 23, 25–31]. This search reveals the putative target sequence ‘2573CACUG2577’ which has the most hits with 14 miRNAs having at least a hit number of 4 (miR-27a/b, -128, -130a/b, -135a/b, -148a/b, -152, -214, -301a/b, -454) (Table1). Among these miRNAs, we focused on 7 miRNAs, or 50%, of these miRNAs. Selected miRNAs for further analysis in this report are miR-152, -128, -27a, -214, -454; with results concerning the role of miR-130a and miR-301a in another context to be reported elsewhere (Woo et al. unpublished). 1 = hit, 0 = no hit. To correlate selected miRNA expression patterns with CSF-1 mRNA and protein expression, we used three ovarian cancer cell lines and NOSE.1 ovarian epithelial cells which are minimally invasive. Bix3 ovarian cancer cells are less invasive compared to the metastatic and more invasive ovarian cancer cells, Hey and SKOV3. Bix3 also express a low level of CSF-1 compared to Hey and SKOV3, which express high levels of CSF-1 mRNA and also secreted CSF-1 protein (Figure1A, B). In addition, NOSE.1 express intermediate amounts of CSF-1 mRNA and secreted CSF-1 protein, and was used for comparison of miRNA expression. Expression of miR-128 is significantly inversely correlated with CSF-1 protein expression (correlation coefficient = −0.998, p = 0.002), with miR-128 RNA level low in Hey and SKOV3 and high in Bix3 ovarian cancer cells, as well as in NOSE.1 ovarian cells (Figure1C). In contrast, expression of miR-152 appears to be positively correlated with CSF-1 expression, with miR-152 expressed at a high level in Hey and SKOV3 with lower expression seen in Bix3 cells and minimal expression in NOSE.1 cells (Figure1D), but this correlation was not statistically significant. The expression patterns of the remaining 3 miRNAs were more variable. miR-27a and miR-214 are expressed highly in SKOV3 cells compared to other cell lines (Figure1E, F). miR-454 is expressed more in SKOV3 and NOSE.1 cells than Hey and Bix3 cells (Figure1G). Their expression patterns were not significantly correlated with CSF-1 mRNA or protein expression (P = NS). A) Expression of CSF-1 mRNA in ovarian cancer cells. B) Secreted CSF-1 protein levels detected by ELISA. C) miR-128 RNA level is high in Bix3 ovarian cancer cells compared to Hey and SKOV3 ovarian cancer cells. D) miR-152 RNA level is low in less aggressive Bix3 cells compared to Hey and SKOV3 cells. E) miR-27a RNA level in ovarian cancer cells. F) miR-214 RNA level in ovarian cancer cells. G) miR-454 RNA level in ovarian cancer cells. Bars represent mean ± SD of triplicate experiments. Since generally miRNAs are known to down-regulate target mRNAs, we would expect that CSF-1 mRNA and miRNA levels would be inversely correlated. However, there are also reports that some miRNAs are involved in up-regulation of translation. This usually occurs through a feedback loop when the target mRNA is indirectly regulated by upstream inducers or inhibitors. To address this issue, we decided to study, in more detail, the roles of miR-128 (as being inversely correlated to CSF-1 expression) and miR-152 (as appearing to be most positively correlated to CSF-1 expression) in the post-transcriptional regulation of CSF-1 expression. To further confirm the expression pattern of miR-128 and miR-152 in ovarian cancer cells, we applied the Splinted Ligation technique to directly detect these miRNAs. miR-128 RNA is detected in both NOSE.1 and Bix3 cells and not detectable in Hey and SKOV3 ovarian cancer cells (Figure2A). 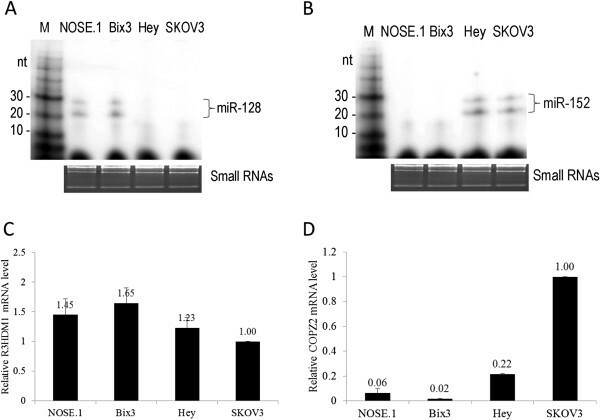 In contrast, miR-152 RNA is detected in Hey and SKOV3 cells, and not detectable in NOSE.1 and Bix3 cells (Figure2B). These results correlate well with qRT-PCR data (Figure1C, D). A) Splinted ligation of miR-128 in ovarian cancer cells. miR-128 RNA is detected in both NOSE.1 and Bix3 cells. B) Splinted ligation of miR-152 in ovarian cancer cells. miR-152 RNA is detected in both Hey and SKOV3 cells. C) miRNA expression pattern follows “host” gene expression pattern. R3HDM1 mRNA expression in ovarian cancer cells. D) COPZ2 mRNA expression in ovarian cancer cells. GAPDH mRNA was used as a loading control in qRT-PCR. Bars represent mean ± SD from triplicate experiments. Since profiling of host mRNA expression could be correlated to the expression pattern of microRNAs, the knowledge of the relative expression pattern of miRNAs and their “host” genes would allow for a better profiling of the miRNA expression. This aspect could be important when using the expression of a certain miRNA as a biomarker to correlate with disease outcome. miR-128 is highly expressed in human brain tissue and its function is linked to neuronal differentiation. miR-128 gene is imbedded in two paralogous genes, both present in the intronic region of their respective “host” genes. miR-128-1 is in R3HDM1 gene on chromosome 2q21.3 and miR-128-2 is in ARPP21 gene on chromosome 3p22. Both gene products are processed into the same mature miR-128. miR-152 belongs to the miR-148 family whose putative role is still elusive, but it has been studied in hepatic, cervical, and brain cancers. miR-152 gene is imbedded in the intronic region of COPZ2 gene, which is a subunit of coatomer protein complex 1 (COP1) known to be responsible for Golgi to ER transport. In both cases, expressions of miR-128 and miR-152 follow their host gene expression patterns (Figure2C, D). The slight discrepancies between host gene and miRNA expression pattern may be due to differential processing that is involved during the maturation of mRNAs and miRNAs. The miRanda v3.0 target scanning algorithm predicts two target regions (Target-A and –C) for miR-128 and two target regions (Target-A, and -B) for miR-152 in the 2,172nt CSF-1 mRNA 3’UTR (Figure3A). All three targets share the common sequence of ‘CACUG’. These two miRNAs are related through a Target-A sequence at region 2573–2577. This Target-A sequence appears to be important for CSF-1 regulation by miRNAs because it is predicted to be a target sequence for several miRNAs. Moreover, the ‘CACUG’ comprising these target sequences was described as a conserved target motif that conferred miRNA regulation to its mRNA 3’UTR region in mouse embryonic stem cells. A) Luciferase reporter constructs with 2,172nt full length CSF-1 mRNA 3’UTR cloned at the 3’-end of the luciferase mRNA. Either CSF-1 mRNA 3’UTR wild type, Target-A point-mutation (M2573), Target-B point-mutation (M2672), or Target-C point-mutation (M3797) sequences were cloned. B) Only Target-A construct results in an increase in luciferase RNA and C) luciferase activity in Bix3 cells. Bars represent mean ± SD from triplicate experiments. To find the actual target sequence for miR-128 and miR-152, we used a luciferase reporter system. A full length wild type 2,172nt CSF-1 mRNA 3’UTR was ligated at the 3’-end of luciferase RNA. In addition, the three individual target sequences within the wild type 3’UTR sequence were individually point-mutated from ‘CACUG’ to ‘CGCGC’ and ligated to the 3’-end of luciferase RNA (Figure3A). These constructs were transfected into Bix3 cells. 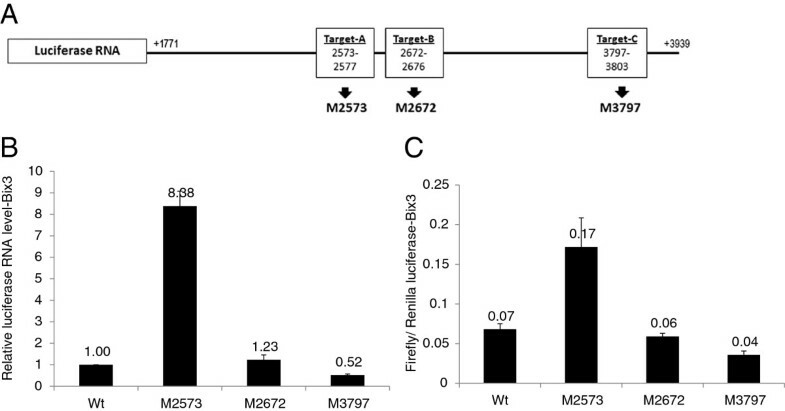 Only the Target-A mutation (M2573 construct) increased both luciferase RNA level by 8.38-fold (p < 0.001) and luciferase activity by 2.43-fold (p < 0.001) compared to wild type sequence (Figure3B, C). There was no significant difference (p = NS) between the effects of Target-B mutation, Target-C mutation, or the wild type sequence. This data suggests that Target-A is a cis-acting regulatory sequence in CSF-1 mRNA 3’UTR which may respond to miRNAs. This data also suggests that both miRNAs have more effects at the RNA than protein levels. To further confirm Target-A as an actual miRNA-responding sequence, miR-128 or miR-152 was overexpressed together with either wild type construct (Luc-CSF-1 3’UTR-Wt) or Target-A mutant construct (Luc-CSF-1 3’UTR-Mut). 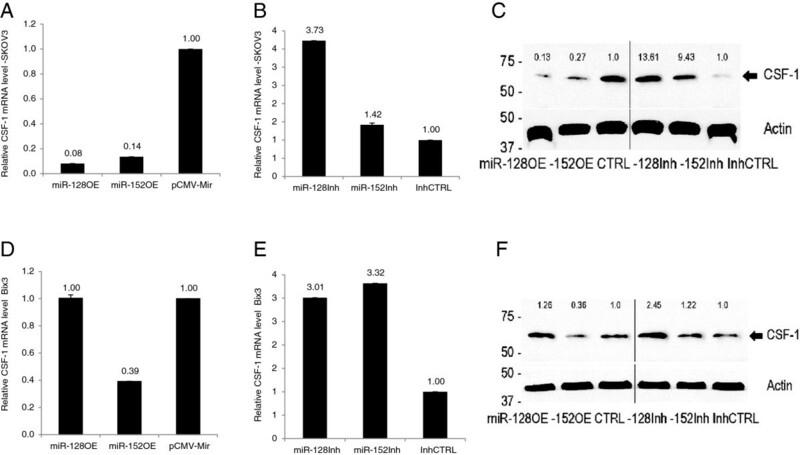 Overexpression of either miR-128 or miR-152 in Bix3 cells co-transfected with the wild type construct decreased luciferase RNA by 39% and 93%, respectively (p < 0.001). Luciferase activity was decreased by 40% in response to miR-152 overexpression (p = 0.006) (Figure4A,B). Overexpression of miR-128 in these cells already overexpressing high levels of endogenous miR-128 (Figure1C), does not change luciferase activity (p = NS). In this context, exogenously introduced miR-128 may not have a strong influence on luciferase translation. In contrast, overexpression of either miR-128 or miR-152 in Bix3 cells transfected with the Target-A mutant construct did not decrease luciferase RNA significantly (p = NS) compared to the wild type construct (Figure4C). In the presence of the Target-A mutant construct, miR-128 overexpression also had no significant effect (p = NS) on luciferase activity. There was a small but statistically significant (p = 0.03) decrease in luciferase activity by miR-152 overexpression (Figure4D). Comparison of Figures4B and 4D, however, demonstrate that the Target-A mutation construct largely attenuates the effect of miR-152 overexpression on luciferase activity. This suggests that both miRNAs target this region Target-A (2573CACUG2577) in CSF-1 mRNA 3’UTR. Target-A is an active target for miR-128 and miR-152. Either miR-128 or miR-152 was overexpressed together with either A, B) wild type construct (Luc-CSF-1 3’UTR-Wt) or C, D) Target-A mutant construct (Luc-CSF-1 3’UTR-Mut) in Bix3 cells. Bars represent mean ± SD from triplicate experiments. To determine the effects of miR-128 and miR-152 on the expression of CSF-1, either miR-128 or miR-152 were over-expressed or inhibited in SKOV3 and Bix3 ovarian cancer cells. In SKOV3, overexpression of miR-128 decreased CSF-1 mRNA level by 92% (p < 0.001) (Figure5A) and CSF-1 protein levels (~60 kDa) by 87% (Figure5C). In SKOV3, overexpression of miR-152 decreased CSF-1 mRNA level by 86% (p < 0.001) (Figure5A) and CSF-1 protein levels (~60 kDa) by 73% (Figure5C). In contrast, in SKOV3, inhibition of miR-128 increased CSF-1 mRNA level by 3.73-fold (p < 0.001) (Figure5B) and CSF-1 protein level by 13.61-fold (Figure5C). In SKOV3, inhibition of miR-152 increased CSF-1 mRNA level by 1.42-fold (p < 0.001) (Figure5B) and protein level by 9.43-fold (Figure5C). Alteration of both miRNA levels showed more effect on CSF-1 protein levels than mRNA levels in SKOV3. miR-128 and miR-152 inhibit CSF-1 expression in SKOV3 and Bix3 cells. 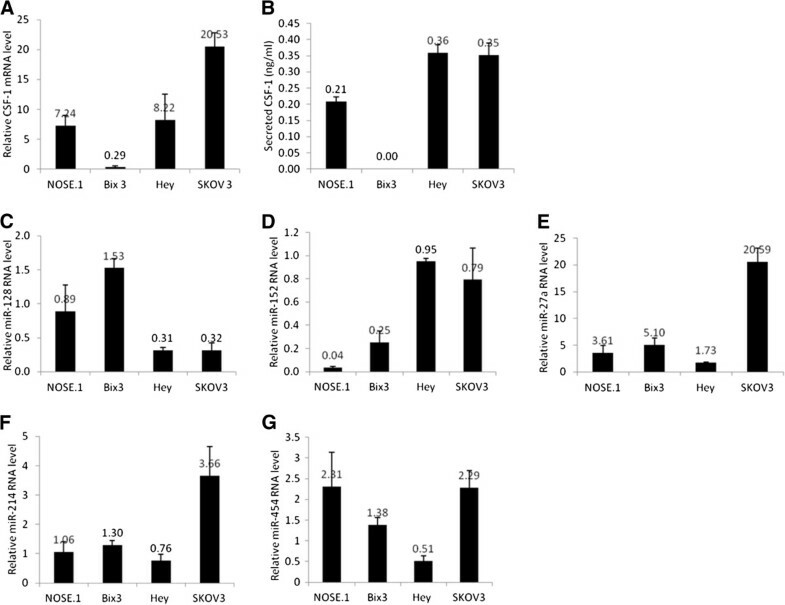 Either SKOV3 or Bix3 cells were transfected with the A, D) miR-128 or miR-152 overexpression plasmids (miR-128OE, miR-152OE); or B, E) inhibitor plasmids (miR-128Inh, miR-152Inh); or vector controls. C, F) CSF-1 protein (~60 kDa) levels in SKOV3 and Bix3 cells were detected by immunoblot analysis. mRNA and protein expression levels were normalized by the levels of GAPDH mRNA and actin, respectively. Bars represent mean ± SD from triplicate experiments. In Bix3 cells, the miRNA effect is less significant than in SKOV3 cells. 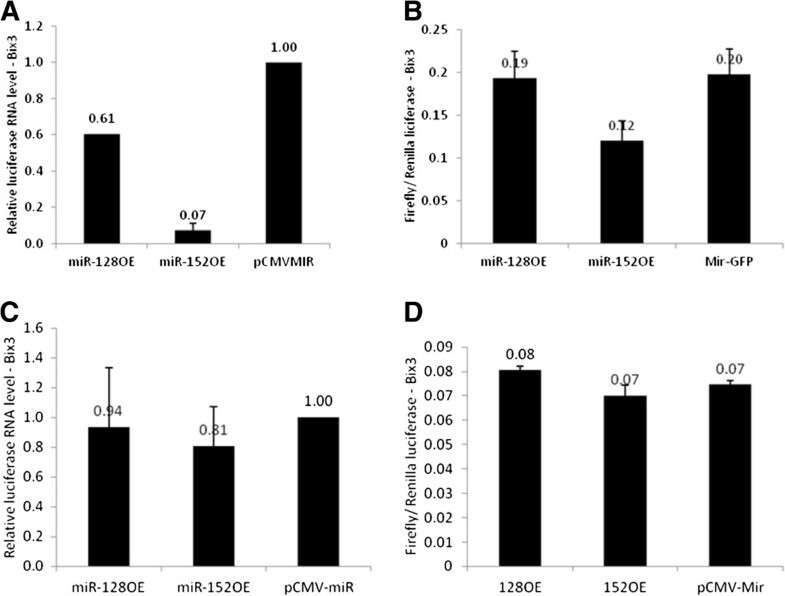 Overexpression of miR-128 does not alter CSF-1 mRNA (p = NS) or protein levels (Figure5D, F). Since endogenous miR-128 RNA level is already high in Bix3 (Figure1), overexpression by exogenously introduced miR-128 RNA may have little effect on CSF-1 expression. In contrast, inhibition of miR-128 increased CSF-1 mRNA level by 3.01-fold (p < 0.001) (Figure5E) and CSF-1 protein level (~60 kDa) by 2.45-fold (Figure5F). In Bix3, overexpression of miR-152 decreased CSF-1 mRNA level by 61% (p < 0.001) (Figure5D) and protein levels by 64% (Figure5F). In contrast, inhibition of miR-152 increased CSF-1 mRNA level by 3.32-fold (p < 0.001) (Figure5E) and CSF-1 protein level (~60 kDa) by 1.22-fold (Figure5F). Either overexpression or inhibition of miR-152 has effect on both CSF-1 mRNA and protein levels. While some differential effects of miRNA alteration are seen between the different ovarian cancer cell lines, overall, the effect of miR-128 and −152 on down-regulation of CSF-1 expression are similar, and may be achieved by both translational repression and mRNA decay. This down-regulation of CSF-1 mRNA by both miRNAs is observed in the context of differing miRNA expression patterns in the ovarian cancer cells. It has been previously established that CSF-1 imparts invasiveness and metastasis in epithelial ovarian cancer[8, 10, 11]. We have shown that this is due, at least in part, to CSF-1 regulation of uPA, a well-known marker of invasiveness in ovarian cancer. It was also recently revealed that both miR-128 and miR-152 have the ability to inhibit neuroblastoma cell motility and invasiveness when overexpressed. We studied the ability of Hey ovarian cancer cells to either adhere to a human derived simple matrix-coated plate in an adhesion assay or translocate through an 8 μm pore-size membrane towards chemo-attractants in a motility assay. The motility of Hey cells was significantly curtailed by over 50% by the overexpression of either miR-128 or miR-152 (p < 0.001) (Figure6A). Furthermore, overexpression of miR-128 or miR-152 in Hey cells inhibited cell adhesiveness by 15-20% (p < 0.001) (Figure6B). At the same time, overexpression of miR-128 had no significant effect on viability (p = NS) (Figure6C). There was a small effect by overexpression of miR-152 on viability (p = 0.004) (Figure6C). Ovarian cancer cell adhesiveness and motility is inhibited by miR-128 and miR-152. After transfection with, miR-128 overexpression construct (miR-128OE), miR-152 overexpression construct (miR-152OE), or Empty vector (pCMV-miR), Hey cells were plated on A) an 8 micron pore membrane for a 6 hour directed motility assay. B) Human matrix-coated membrane for a 2 hour adhesion assay. C) Viability of miRNA overexpression construct transfected Hey cells 24 hours post transfection was determined by a cell proliferation assay. Our findings demonstrate that both miR-128 and miR-152 can negatively impact cell motility and adhesiveness of human ovarian cancer cells, important aspects of their metastatic potential, correlated with suppression of CSF-1 expression. CSF-1 is an established regulator of ovarian cancer biology[8–11], imparting invasiveness and metastasis[9, 11], making it a potentially appropriate therapeutic target. The relatively long 3’UTR of CSF-1 mRNA makes the 3’UTR a likely target for post-transcriptional regulation. We have been studying the effect of GAPDH protein on CSF-1 mRNA stability. GAPDH binds to the AREs in CSF-1 mRNA 3’UTR and stabilizes CSF-1 mRNA. Down-regulation of GAPDH by siRNA decreases CSF-1 expression in ovarian cancer cells. In the present study, our goal was to identify miRNAs that down-regulate CSF-1 expression, a small step in our overall quest to find specific inhibitors which may ultimately impact on ovarian cancer metastasis. By using in silico text-mining algorithms against the CSF-1 mRNA 3’UTR, we selected miR-128 and miR-152 that would fit the profile of having regulatory abilities of CSF-1. While miR-128 and miR-152 possess target sequences in the CSF-1 mRNA 3’UTR, their expression patterns in the ovarian cancer cell lines proved to be different. miR-128 RNA level is lower in the invasive, metastatic Hey and SKOV3 ovarian cancer cells in comparison to the less invasive and tumorigenic Bix3 ovarian cancer cells (Figure1C). In contrast, miR-152 level was lower in the Bix3 cells than in the Hey and SKOV3 ovarian cancer cells (Figure1D). Despite this difference in baseline expression pattern, we find that both miRNAs down-regulated CSF-1 mRNA and protein in ovarian cancer cells (Figure5). A relatively small number of ovarian cancer cell lines may not give sufficient information when comparing miRNA expression patterns to effect on target mRNA (CSF-1 mRNA). The majority of the miRNAs originate from intergenic regions far from other known genes and they possess independent transcription units. On the other hand, about a quarter of human miRNA loci are intragenic and they reside in the intronic regions of pre-mRNAs. Most of these latter ones will have a preferential sense orientation with the “host gene” and because they are lacking their own promoters, as a result, will be processed from introns. Sharing a common promoter can result in miRNAs and “host” genes exhibiting regulatory relationships. In our study, both miR-128 and miR-152 reside in introns of R3HDM1 gene and COPZ2 gene, respectively. Their expression patterns follow those of their host transcripts. COPZ2 encodes coatomer protein complex ζ2, which is involved in intracellular traffic and autophagy in golgi. miR-152 and its host gene COPZ2 are silenced in tumor cells and introduction of miR-152 precursor inhibited tumor cell (MDA-MB-231, HeLa) growth. Recently, both miR-128 and miR-152 have been shown to inhibit neuroblastoma invasiveness. These data suggest important biologic roles of miR-128 and miR-152 in cancer. In this report, we add the findings that over-expression of miR-128 or miR-152 in ovarian cancer cells results in a significant reduction in both motility and adhesiveness (Figure6), therefore inhibiting important aspects of invasiveness and metastasis. There is a recent report stating that the predominant effect of mammalian miRNAs is on mRNA decay which results reduced translation. In contrast, in zebra fish, miR-430 reduced translation initiation prior to inducing mRNA decay. Djuranovic et al. reported miRNA-mediated translational repression is followed by mRNA deadenylation. In addition, the concept of mRNA destabilization by miRNAs gained support by genome-wide observation studies. In SKOV3, effects of either miR-128 or miR-152 are more prominent on CSF-1 protein level than on the CSF-1 mRNA level (Figure5A-C). In contrast, in Bix3, both miRNAs have either a similar or slightly more influence on the CSF-1 mRNA level than CSF-1 protein level (Figure5D-F). Different cell lines, as expected, show some differential responses to miRNAs, in part due to additional 3’UTR factors which may regulate miRNA activity. Identifications of these other regulatory factors are in progress in our laboratory. In CSF-1 mRNA 3’UTR, we identified three potential miRNA target sequences for miR-128 and/or miR-152 (Figure3). Target-A appears to be a miRNA ‘hot-spot’ as our bioinformatics analysis predicted at least fourteen miRNAs, including miR-128 and miR-152, targeting a region of 2573–2577 (Target-A) in CSF-1 mRNA 3’UTR (Figure3). This Target-A sequence is highly conserved both in human and mouse. Mutation of Target-A resulted in a dramatic increase in reporter RNA and activity when compared to the wild-type construct (Figure3). Target-A mutation also abrogated response of reporter RNA and activity to miR-128 and miR-152 over-expression (Figure4). This suggests that Target-A is a critical cis-acting regulatory sequence, and we have validated that it serves as a direct target for at least miR-128 and miR-152 (Figure4). The current study identifies miR-128 and miR-152 as important regulators for CSF-1 mRNA and protein expression, and of ovarian cancer cell behavior. We identify an important CSF-1 3’UTR miRNA common target sequence through which these miRNAs function. Human ovarian cancer cells, Bix3, SKOV3 and Hey[10, 11], were grown in 10% fetal bovine serum-enriched Dulbecco's Modified Eagle/F12 Ham’s medium (Invitrogen) supplemented with 1% penicillin-streptomycin (HyClone). Immortalized ovarian epithelial cells NOSE.1 were grown in M199/MCDB1051 supplemented with 15% FBS and 1% penicillin-streptomycin (HyClone). All cells were incubated at 37°C and 5% CO2. Total RNA was extracted with Trizol (Invitrogen). miRNA expression was determined by the stem-loop qRT-PCR to increase the specificity of miRNA amplification. miRNA and tRNA specific cDNA synthesis was followed by real-time PCR on an Eppendorf Realplex2 with tRNA as internal loading control. Reactions were incubated during initial denaturation for 10 min at 95°C, then for 40 cycles of 15 sec at 95°C and 1 min 60°C. Final miRNA expression values were calculated with the ΔΔCT method. Primer sequences used are shown in Table2. Similarly, CSF-1 and Luciferase transcripts were quantified with real-time PCR using the following primer set shown in Table2. Calculations were based on the GAPDH mRNA or G-418 RNA internal controls. miRNA expression was confirmed by splinted ligation as described by Maroney et al.. In short, bridge and ligation oligonucleotides were designed for the miRNAs of interest. The ligation oligo was labeled with [γ-32P]-ATP (Perkin Elmer, cat. no. BLU002A) using T4 polynucleotide kinase (Fermentas). Separation of ligation mixture was performed on a 10% urea gel and radioisotope emission was detected by phosphor imager. Cells were plated on a 6 well plate one day prior to transfection with 4 μg of plasmid DNA/well using 2.5:1 v/w ratio of Fugene HD (Promega). miRNA expression vectors and miRNA target reporter vectors were purchased from Origene. Fifty μg of total protein lysates were subjected to SDS-PAGE and electroblotted onto PVDF membrane. The membranes were probed with mouse monoclonal anti-CSF-1 (ab66236, Abcam) and anti-Pan Actin (ACTN05, NeoMarkers, Fremont, CA) antibodies. After TBS-T washes and incubation with anti-mouse (HRP)-conjugated secondary antibody, the proteins were detected with a SuperSignal chemiluminescence (Pierce). Each target was replaced by Asc I endonuclease site which converts ‘TGCACTGA’ to ‘GGCGCGCC’ by PCR cloning and fused to the 3’end of luciferase RNA in pMir-Target (Origene). Forty eight hours after transfection with the reporter plasmid, cells were lysed and luciferase activity was determined using the Dual Luciferase Assay System according to the manufacturerâ€™s protocol (Promega). Transfection efficiency was determined (where needed) by cotransfection with a GFP plasmid and microscopy. For the directed motility assay, 24 hours post transfection, 4 x 104 cells were seeded in 1% Nu serum in the top chamber of 24-well inserts with uncoated 8 μm pore membranes (BD biosciences). The bottom chamber contained 20% FBS and 12.5 μg/ml fibronectin as chemo-attractants. Six hours after seeding, the top chamber cells were wiped off with Q-tips and the top and bottom chambers were washed with cold PBS, then dried and frozen at -80°C for 30 minutes. Bottom chamber cells were quantified by the lysis method using CyQuant Cell Proliferation Assay Kit (Invitrogen) as per the manufacturer’s protocol. For the adhesion assay, 24-well inserts with human matrix-coated membranes (BD biosciences) were used. The human matrix consisted of type IV collagen, laminin, and gelatin. 24 hours post transfection, 5 x 104 Hey cells were implanted and incubated for 2 hours prior to crystal violet staining according to the previous report. The WST-1 assay (Clontech) was used to assess degree of cell proliferation among the conditions 24 after transfection. Data is depicted as mean ± SD from at least three independent experiments. The one-way ANOVA test was performed using SigmaStat (Jandel Scientific Corp.). P < 0.05 was considered statistically significant. The Pearson product moment correlation test was performed using SigmaStat (Jandel Scientific Corp.) for correlation analysis between miRNA and CSF-1 mRNA or protein expression levels. This work was supported in part by NIH/NCI P30 CA23074 and NIH CA60665, Women’s Cancers of the University of Arizona Cancer Center, Tucson AZ, and the Rodel Foundation (to SKC.). Ho-Hyung Woo, Csaba F László contributed equally to this work. HHW and CFL carried out most of the experiments including the quantitative real-time qRT-PCR for CSF-1 mRNA, miR-128 and miR-152 as well as the overexpression and suppression of miRNAs and wrote the manuscript. SG performed the WST-1 cell proliferation assay. HHW and SKC discussed the design of the experiments, the results, the analysis, and wrote the manuscript. All authors read and approved the final manuscript.